Sinister DVD Review If you can ignore the clichés, the predictability and the modern horror film ending, Sinister is a clever spin on serial killers and the paranormal. 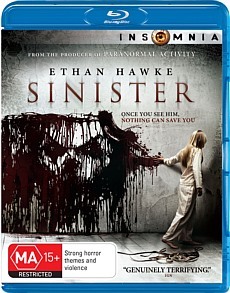 From the producer of Paranormal Activity and Insidious comes Sinister, a film that is steeped in the paranormal and actually manages to surpass both these films in terms of entertainment. 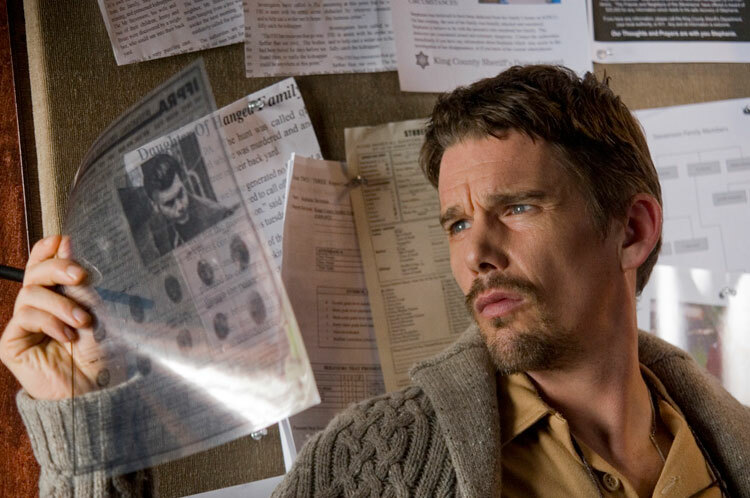 The story of Sinister revolves around Ellison Oswalt (Ethan Hawke), a novelist who has moved into a new home with his family to assist with research on a new true crime novel. This home is also the place where an unsolved murder of its previous inhabitants occurred. Four of the family were found hung from a tree in the backyard with their youngest daughter missing. Although what begins as a muse for Ellison eventually becomes the catalyst to a chain of devastating paranormal events. To make matters worse, Ellison keeps the dark history of the home to himself and while exploring the home, he discovers a box of old super 8 reels which help him piece together the history of the murdered family. To further complicate the situation, some of these home movies are from other families from around the country who were murdered in almost ritualistic ways. As his investigation proceeds, it appears that something "sinister" is inside the house and things eventually go from the odd bump in the night to truly strange and quite frightening events. Thankfully the movie is carefully directed by Scott Derrickson (The Exorcism of Emily Rose) who manages to keep the tension of the film quite nerve racking and will make you jump out of your seat on more than one occasion. Ethan Hawke is brilliant as Ellison Oswalt, the disturbed writer as is Juliet Rylance who plays his wife. Actor James Ransone adds an element of realism and comedy into the film as the local deputy who assists Ellison. Another highlight of the film is the minimal use of gore that seems all too popular in some Hollywood horror films of late. With that said, Sinister moves away from this and sometimes the suggestions can be more powerful than the visuals. If Paranormal Activity 4 annoyed you than Sinister may help you with your horror fix, especially the intensity of what is occurring in this home. If you can ignore the clichés, the predictability and the modern horror film ending, Sinister is a clever spin on serial killers and the paranormal.